View the World Water Day 2018 photo contest album. Waterloo – Wilfrid Laurier University and the University of Waterloo will host the ninth annual World Water Day celebrations to discuss and celebrate water research from 9 a.m. to 8 p.m. on March 22 at the Science Teaching Complex on the UW campus. The Laurier Institute for Water Science and the University of Waterloo's Water Institute will highlight research around the theme of "nature for water." 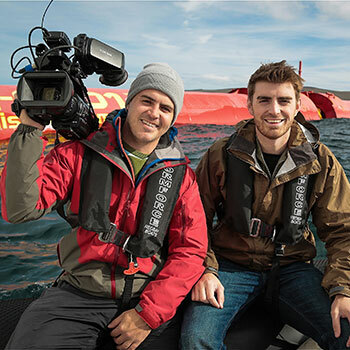 The keynote speakers, Alex and Tyler Mifflin, also known as TVO's The Water Brothers, are two young eco-adventurers who produce an award-winning docu-series. The brothers travel the world to identify issues around water and how to protect one of the world's most precious resources. The keynote will be followed by a discussion panel entitled, "Green infrastructure: We know it works, so why aren't our cities being built green?" facilitated by John Hartig, Fulbright Canada Research Chair in Governance at the Balsillie School of International Affairs. The event will also feature a student poster symposium, a photo contest, industry and community exhibitor booths and networking opportunities with water researchers, professionals and enthusiasts. The United Nations established World Water Day in 1993 to increase global awareness of the importance of water to the environment, agriculture, energy, health and trade. Each year for the last nine years, students from the Water Institute and the Laurier Institute for Water Science co-host a full day of activities to highlight the breadth and depth of their water research. Volunteers are needed to help make the day run smoothly. View the full agenda and event details. View the 2017 photo contest submissions.